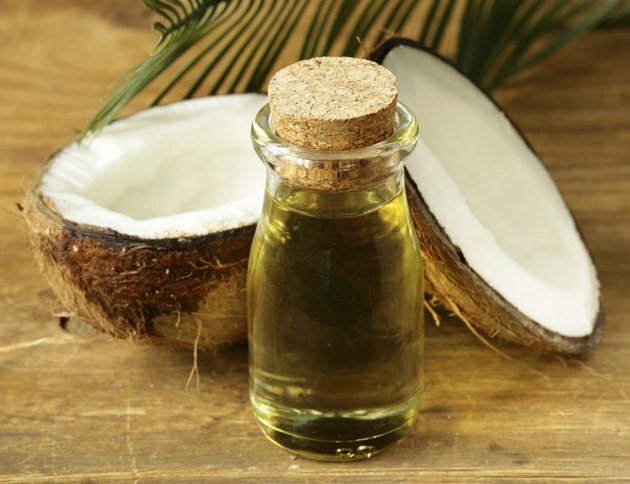 Although more than 90 percent of coconut oil is from bad-for-the-heart saturated fat, the oil has a strange effect of boosting levels of "good" HDL cholesterol in the bloodstream and can be enjoyed in moderation, according to Harvard Health Publications. Picking the best oil on the shelf can be a bit challenging, however. The label "extra virgin" applied to coconut oil is virtually meaningless. Unlike olive oil, where virgin and extra virgin oils contain different amounts of free fatty acids, there are no regulations governing the purity of coconut oil. There are essentially two types of coconut oil -- virgin and refined. Virgin coconut oil, or VCO, is made by cold-pressing the liquid from the coconut meat, then separating the oil from the milk and water. Refined, bleached and deodorized, or RBD, oil is made from the coconut copra or dried kernel and may be chemically treated. VCO and RBD oils have the same milky white appearance, so you can't distinguish between the two on looks alone. However, VCO tastes and smells like coconut, while RBD oil is essentially free of odor and flavor. Coconut Oil Central: Extra Virgin Coconut Oil: Best Type of Coconut Oil? Tropical Traditions: How Is Commercial Coconut Oil Produced?